Remember that last Henry Weinhard’s beverage we reviewed that was so very GROSS?! No? Me neither as they’ve all been pretty dang good. Hopefully today’s entry into our journal, or as it will be known in the future after excavation our lore, will be just as fondly remembered. 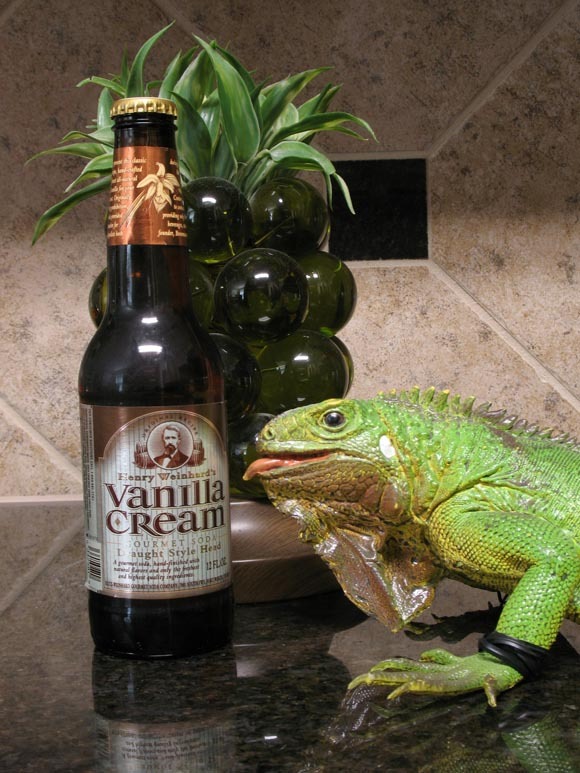 Henry Weinhard’s Vanilla Cream is most definitely a cream soda with a draught style head. It’s loaded with the same great ingredients (minus the fact that they use HFCS), so it should be loaded with the same great taste! Let’s find out. Oooooweeee! That is a vanilla packed aroma. It smells like they jammed so much vanilla in this bottle that it runs to the safety of the outside world to keep from overcrowding. You know the fire marshall has really been eyeing them, trying to ticket them on any little charge. Let’s help our vanilla friends out with their problem by consuming their souls. Fortunately I am consuming another quality product from the shelves of Henry Weinhard. This soda is smooth, but nothing I’m going to write more than this sentence about. Initially I’m finding the taste to most resemble a high quality A&W Cream Soda, but with a sharper feel on your tongue. Odd, the soon-to-be-aftertaste and the aftertaste both have hints of Big Red. Now, I’m not the biggest fan of Big Red so it’s breaking my brain since I’m now experiencing its flavor in something I like. Remember when you were a kid and your parents threw you that awesome dinosaur birthday party? Of course you do, it was SO AWESOME! Your cake was a dinosaur, your hats had dinosaurs on them, and you even got Jurassic Park on VHS/DVD/BluRay. To top it off all of your friends were there! All of them, even that guy that moved away last year! Everything is coming up dinosaurs... until the doorbell rings and THAT GUY is standing there waiting for you to let him in. You don’t like THAT GUY, you didn’t even invite him. Who did? It was probably your mom trying to be “polite”. You open the door, THAT GUY has brought you nothing. He looks around at all the dinosaur awesomeness. “Dinosaurs, hmm? I had a dragon party last year and everyone knows that dragons can beat up dinosaurs.” You’re brain quickly learns your first curse word but doesn’t teach your mouth to say it. From that point on the party never reaches its full potential. Every fun thing that happens goes through a THAT GUY filter, diluting the ‘could be greatness’. That’s how I feel about the Big Red taste appearing in my Henry Weinhard’s Vanilla Cream. Ahhh that felt good. I haven’t had a good pointless rant in a while. Big Red taste or not this is still a better than average cream soda and it’s rating should reflect just that. Twist was never THAT GUY.